a text about 47,XXY as symptomes of ADD/ADHD as well as autism are more prevalent in people with 47,XXY. In my opinion, the magazine covers a lot of difficulties concerning the behavior of people with 47,XXY. I had light bulb moments in nearly every text. As I wrote my text for N#MMER in October 2014, I didn’t have such profound knowledge about 47,XXY, and I looked for proof for any statement in the article. It’s the reason for which the text might have appeared in a school’s magazine rather and is clearly different compared with the other texts. Anyway, I hope I could raise awareness towards the characteristics of Klinefelter/47,XXY. American self-support organisations (like AXYS) assume that a certain number of people with 47,XXY is present among people with autism and ADHD. To clarify: 47,XXY =/= autism spectrum disorders! The prevalence for autism (and ADHD) is significantly enhanced but far away from 100 % (rather between 10 and 30 % for autism). 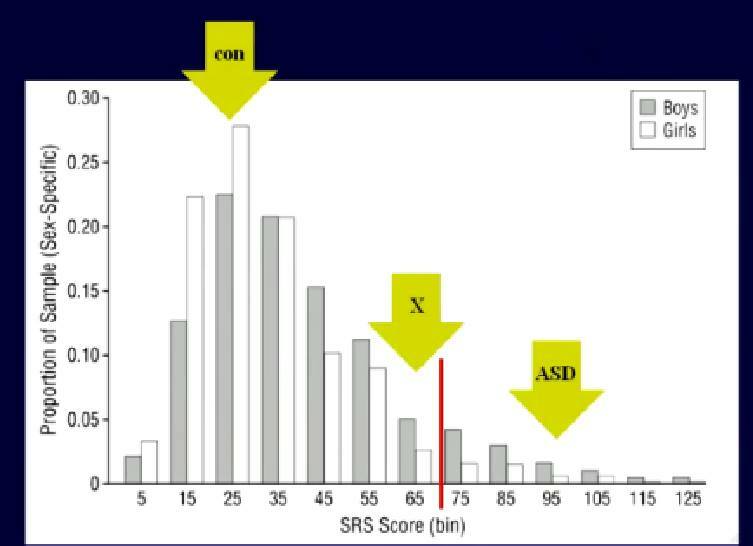 Figure 1: The diagram shows the results of the Social Responsiveness Score (SRS) measuring the degree of autistic traits. Figure 2: The result of the ADI-R test of autism in the three core domains. The horizontal line depicts the threshold value for clinical relevance, the points mark the individual persons with 47,XXY. 10 persons lied above the cut-off in all domains, 11 persons in 2 domains and 13 in one domain. 17 persons were below the cut-off in all domains. The most prevalent domain has been communication (domain 2), the rarest domain has been stereotype behavior (domain 3). Altogether 27 % of people with 47,XXY fulfilled the diagnose criteria for autism spectrum disorder. Cederlöf et al. (2014) examined 86 000 controls and 860 47,XXY: 6 times higher risk of autism and ADHD. Thus there is strong evidence for a link between 47,XXY and ADHD/autism, besides the fact all three conditions show major impairments of executive functions. Bruining et al. (2009) suggests in figure 2 that domain 3 (rituals, routines and obsessive behavior) is weaker in 47,XXY than in idiopathic (male!) autism. Tartaglia et al. (2012) states that the quiet subtype of ADHD (also called ADD, without hyperactivity and impulsivity) is dominant in 47,XXY. People with autism who reveal less symptoms of domain 3 (rocking, flapping, obsessive behavior, mainstream special interests) may be easily overlooked (-> high number of unknown cases in girls and women as well as ‚quiet‘ boys and men). Thus there is a large number of unknown cases, again in girls and women with ADD but also quiet boys and men). If the phenotype of 47,XXY is similar to that of females with ADD and/or autism, both neurologic conditions will be discovered more infrequently in 47,XXY (boys with 47,XXY are often described as shy, passive and quiet). Surprisingly, testosterone levels were not associated with these psychological and social health measures, even though low testosterone has been widely believed to underlie many of these symptoms. “Based on this finding, it is not clear that the testosterone therapy commonly given during puberty will remedy many of the problems that children with Klinefelter syndrome experience,” says Dr. Fennoy. Whether hormonal therapy plays a role during development or not, the researchers emphasize that early intervention to address psychosocial health risks will help patients and their families manage some of the chronic aspects of Klinefelter syndrome. If you have the feeling there is more to you than low testosterone values and associated infertility, go to a psychiatrist or psychologist. When people with 47,XXY are bullied in school, physical appearance may be the cause (weak muscles, body composition, breast development, shame having a shower or in the changing room) but also autistic behavior (difficulties with coordination, shyness, bluntness, naivety, imitating others, isolation and more prone to be a victim). Please take care of your children not to be in agony throughout their school time! They will suffer from bullying, post-traumatic anxiety and depression also throughout their lifetime. Receiving a dual or secondary diagnose will provide additional therapy approaches and support besides hormone replacement therapy. It’s essential to inform your environment and the relative’s environment about 47,XXY. If physical symptomes are merely present but behaviorial symptomes are more obvious, it probably makes no sense to hold a long talk about Klinefelter syndrome. A lot of people who are not familiar with Klinefelter may conclude that Klinefelter is equivalent for hormone deficit, needs hormone therapy and subsequent all deficits will be cured. Then it’s possibly more senseful to inform about the secondary diagnose. The genetic reason is rather interesting for academics. Draw your information and guidelines from concerned people themselves! I linked numberous autistic bloggers in my blog writing about their life and everydaylife with autism. Be skeptical when doubtful things arise like cure of autism with helpf of diets, glute-free food, homeopathy, MMS, etc. A great majority of enlightened people with autism rejects ABA and Autism-Speaks. Read and spread the word for N#MBER! Diagnosed 47,XXY could be helped with additional diagnoses addressing their psychosocial health. Diagnosed people with autism and/or ADHD might have a genetic underpinning of their presumed primary diagnose. It doesn’t mean that the diagnose is wrong but physical health may also play a role, like enhanced risk for cardiovascular disease, diabetes, osteoporosis, autoimmune disorders, and cancer. Lack of Impulse Control: When Communication is Overdosed. Recently, I published a blog text about online dependence leading to a greater dispute about the question whether online communication could be considered as addictive behavior. I understand the intention of people with autism to refuse their special interests and excessive online communication to be considered as addictive behavior. As I went into behavorial therapy a few years ago, I accidently happened to meet a specialist for prevention of addiction – not online but drugs in general. Addictive behavior is divided into substance (alcohol, drugs) and non-substance (buying, betting, sports, internet). It is caused by loosing impulse control and leads to self-damaging behavior without recognizing it. As I tapped into the trap of addictive behavior, I was far away from knowing about my neurologic conditions. Executive dysfunctions are core features of autism and 47,XXY. My former therapist didn’t know about my conditions, either, and did consider my online addictive behavior as main reason for difficulties in everydaylife. He tried to shift my focus to (offline) everydaylife but I didn’t succeed because of my verbal communication difficulties. I tried a cold turkey because I thought my internet behavior is the main reason. Ok, ten years ago, it would have been possible to stay out of the virtual world for a certain period. Today, however, in 2015, situation has changed. Moreover, the majority of my special interests is only possible with aid of internet tools, like weather charts, radar, weather data in general and a lot of other things, like writing blogs, communicating with journalists, etc. A cold turkey would have destroyed me in the long term since I had difficulties to manage my everydaylife. A strong wish or kind of obsession to consume substance causing addiction. Reduced ability to control start, termination and quantity of the substance. Physical acute delirium when consumption is finished or reduced. Proof of tolerance: To obtain the effect of originally lower amounts of the substance, increasingly higher amounts are necessary. Progressing negligence of other interests and pleasure in favour of the consumption of the addictive drug and/or enhanced expenditure of time to acquire and consume the substance or to recover from the effects. The factors 1-5 seem to be typical for special interests in autism spectrum conditions. Moreover, we feel much more relaxed communicating in a written form instead of a phone call or a face-to-face meeting. I don’t want to list up all advantages. Most of you know them well, otherwise you wouldn’t read my blog. Despite having great advantages of using internet excessively, I had some serious negative impact I can’t blend out. In 2003, I missed the famous aurora in Central Europe because I preferred to chat instead of going onto the balcony. In 2005, I missed a tornado because I preferred to chat in ICQ and write in a weather forum instead of going outdoor. I cancelled a dinner with a friend he made for me with high effords because I preferred to stay at home and chat. I rapidly lost concentration and focus on reading scientific books and papers well as learning for exams if a computer stood nearby in the same room. I also felt uncomfortable when I couldn’t go online for a longer time than a few hours. I was asked whether the inability to manage everydaylife is the cause or effect of being online. In the case of people with social communication difficulties, it might be both of it. On the one hand, social communication and chances to manage everydaylife with internet tools, is a blessing for us. We need it to express our feelings and wishes, opinion and existence. We stay in persistent contact with people we like and people who help us. We will likely have a much harder time without it, especially if the social environment isn’t holding but detrimental. All of us benefitting from this opportunity shouldn’t be blamed as addictive or even pathologic. I guess… when it comes to therapy and addictive behavior is mentioned either by your parents, friends or therapist, addictive behavior may arise as a primary diagnosis. The reason to write this blog text is, to look behind the obvious symptomes and to look for the true reasons. As ADD, ADHD, autism, diabetes, osteoporosis, etc… may all result from having 47,XXY or related genetic conditions, some primary diagnoses turn out to be wrong (the genetic condition is the primary diagnosis, and autism the result of it). The term for your behavior may be still addictive behavior, it doesn’t matter for officials if you like it or not. So why changing behavior which seems to help us? There are at least some exceptions. There is no black and white in any behavior. Whether you’re autistic or not, everyone needs sufficient sleep, good food and physical as well as mental health. It’s important to retain control. Control your feelings when you’re at work (not having emotional outbursts in front of your boss), control spending money if you’re strapped, control to handle your daily work. I experienced to loose control of nearly any important piece of my life. To balance online and offline life (our body lives offline and we will die offline, children are born offline), I prefer to do hiking tours when I’m disconnected from the internet. In the nature I can relax, get fresh air, free thinking and develope ideas. I can forget things at least for a short time stressing me. Keeping my sleep hygiene under control means I need to go in bed early enough if I have an appointment or work to do the next day. Depending on the amount of support in everydaylife, some of us need a job to survive. It’s nice to have special interests like video games or writing hundreds of blog entries. Are they sufficient to earn money with it? Some people with autism are working as game developers, others are writing books or drawing cartoons. Even someone who has a spleen to identify train types may work someday at a railway company. I was fascinated by weather and studied meteorology. In my opinion, it’s even possible as a person with autism or genetically determined difficulties with impulse control, not to use autism as an excuse to loose control but to look for possibilities to stay fit for everydaylife. Unfortunately, we don’t live in a world where everybody is taking care of your difficulties. Unfortunately, there are still situations where we need these offline skills like having a phone call with officials, going shopping, having a job interview, etc. I certainly know it’s not easy to learn it, especially when your neurologic package is enhanced by anxiety, traumatic experience and depression. If I look back, I know it’s possible to increase life quality and still remaining in contact with all online contacts I won in the recent couple of years. Life quality for me includes physical health (enough sport, balanced food, enough sleep), the feeling of well-being when I’m hiking alone in the mountains, as well as managing the to-do-list of necessary and rarely loved things in everydaylife. Sometimes, I fail doing so but I don’t blame myself for it. I know I’m more rapidly exhausted as a neurodiverse person. It’s ok to fail. A lot of people with autism and attention-deficit disorder will experience that, too, especially when it comes to seek for a diagnosis and disclosure afterwards. For those of us having doubts about potential addictive behavior with internet, don’t deny to have had these experiences. Whether the term addictive behavior and standard therapy to reduce it without taking the environment into account, is the right path when you benefit from more internet usage than the average population, is another question to discuss. However, there are much more than us really suffering from it, or having had at least a history of negative impact (like myself). I’m able to admit that and try to focus on the advantages now and in the future. I’ll go back to XXY experiences here. For most of the people, the typical way of discussing important things is the face-to-face way. People who are verbally not impaired prefer the verbal way of communication. They tend to refuse the written form because they assume it’s much easier just to meet and clear the issue exchanging arguments, instead of writing long e-mails and having to answer in a similar way. It costs too much time. If you’re asking therapists or coaches, they will tell you the same – it’s better to settle a difference face to face than with an e-mail or by other sorts of written communication (SMS, messenger, whatsapp, etc…). What I learned about myself is that communication is a minefield irrespective of the chosen form. However I struggle much more with face-to-face communication than in a written form. When I’m face to face with a person to whom I have an important discussion (no chit-chat) where I intend to carry my point, I struggle with finding the right wording and I can’t even built complete sentences, neither in german nor in english. Auditory processing delay may contribute to losing the threads as I need time to think about what was said but discussion is already advancing and I risk to forget what has been said. I also tend to focus on what I will say instead of listening. I often end up argueing lousy, putting up arguments which are – of course – too emotional and not fact-based enough to convince the person whom I’m talking to. It also happens that I come up with a certain intention and during the discussion I just lose the thread while talking. I’m aware of losing my thread and that the discussion runs into a false direction and runs the risk of ending up with a potential worst case scenario (i.e., I didn’t succeed but things are getting even worse after the talk) but I can’t stop it. After such discussions I’m often totally exhausted needing a rest in a quiet place. Hypersensitivies worsen after such ’socialising‘ and every noise and every movement in my surroundings are just too much. I feel the strong impulse to withdraw and I have to avoid crowds of people not to run into a panic attack. Sometimes, I become silent and I don’t want to answer or to speak for hours (shutdown). In other cases, I tend to become very sarcastic, and people are wondering about my choice of words, especially when sarcasm is inappropriate in that situation. After worst case scenario discussions I have a long time upcoming when I think about the course of the discussion and what I should have said instead. Ruminating about the correct choice of words and arguments is a typical consequence of face-to-face discussions. I know that from other XXY people, too. Communication for many of us means for the counterpart they need to give us more time. While our minds are stuffed with thoughts, with many options and arguments, expressing our thoughts is delayed. Word finding is often an issue, and bad short-term memory prevents us from recalling the facts-based arguments. If you can’t avoid a face-to-face discussion, it seems to be appropriate to take notes as much as possible. Bring notes to recall your arguments and take notes from the counterpart to remember important statements. Depending on the surroundings we also highly suffer from distractions. People talking simultaneously, construction noise, a vacuum cleaner, ticking clocks, a radio playing in the background – this noise may be highly distracting and contributes to quickly losing the thread in a discussion. The same holds for interruptions when another person enters the room and wants something. Besides distractions and losing threads, we have difficulties recognizing facial expressions. We are able to distinguish between good (happy) and bad (angry, sad) faces but we have great difficulties distinguishing between angry and sad faces. In an important discussion we might miss the point when we should stop argueing before situation escalates. The message carried out by our own facial expression might differ from the things we actually say and may confuse the counterpart. It may end up that the counterpart doesn’t believe us when we try to argue and body language and facial expressions look guilty or we even smile accidently while talking about something serious. As said in the beginning, face-to-face communication is a minefield for MANY of us. I still want to emphasize that MANY XXY struggle with similar problems but not ALL. It allows me to gather my thoughts and speak without getting upset. It allows me to think about what I’d like to argue for, and I also have time to think about the answer before answering myself. I have the chance to bring my arguments step by step, without the risk to loose my thread. I’m not distracted by the surroundings or by misleading facial expressions (I don’t notice when someone is pretending an attitude). I have notes which are easy to recall while verbal statements may be lost after a short time. Of course, I’m aware of the advantages of face to face but these advantages aren’t valid for ME. I also know I can’t avoid the disadvantages of writing, like misleading statements because the counterpart doesn’t see my face and body language (probably better, he/she doesn’t) while making this statement. He might interpret it in a wrong and potentially damaging way for our relationship, depending on his picture (and prejudice) about me. Verbally communicating people dislike writing because it costs time. Why write a long e-mail when you could simply make a phone call or meet the other person in place? Last point which is important for me… I described different ways of communicating, neither a right nor a wrong way to do it. In my opinion, both ways are valid and value-free. There are much more people out there preferring writing, like people with autism (especially the nonspeaking ones), people with mutism, deaf people. You could even have had a disease preventing you from talking. No matter what reasons or causes let you prefer writing instead of verbal communication – it’s a legitimate form of communication. Who is jumping over the gap? I don’t know how many people really do that. I mean reflect oneself and thinking about own behavior, social rules, what is intuitive and what is rational, thinking different in patterns, words or pictures, or talking at personal levels or factual levels. Most people don’t have to think about this, they just do and they seem to perform well most of the time. Given a broad social environment and holding environment, feedback is sufficient to adapt the own behavior. And what about me? I stand outside and look at the people socialising and think it’s a foreign language to learn instead of dropping one brick after another. Main problem now is… I’m aware of being different. I know that I do a lot of things different. I behave different. I do not manipulate or form strategic alliances, which I should do. I know very much now and I’m certainly not in the mood of stalling in this position, looking even for excuses. Moving forward is possible to some degree without the environment. Now I’m stalling again because there is a gaping abyss between me and the others. I’m willing to jump but the people on the other side barely move towards my direction. They just walk alongside the gap and behave as if my parallel reality is not existing. I wave my hands and try to become noticeable: „here I am“, without the intention to move so bluntly forward that it really pushs them to react. I’d like to make them curious about the change I cycled through in the past months but I don’t want them to think I look for excuses. I could jump and behave like them which appears artifical because it is artificial. I would be even satisfied if they just turn around, notice there is a gap and start thinking about it. Restarting a relationship is not a one-way-ticket. I do everything I can although it is exhaustive from time to time. The opposite side could notice that and appreciate these effords, and lower their expectations that I just have to catch up with them to be like them. I won’t. I prefer to be myself which is necessary to play out my strengths. I’m rather inclined to step back before I fall into an abyss, and people are not even aware of its existence.